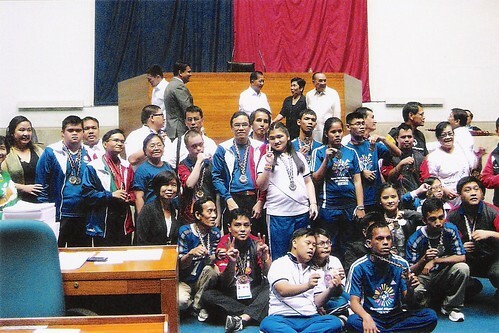 One of the biggest moment for the special athletes is when they took their traditional Athlete’s Oath: "Let me win, but if I cannot win, let me be brave in the attempt." Athletes from the 2013 Asia Pacific Games in Australia were welcomed in Congress by Representative Abueg. The Philippines’ Michael Almendrala, a person with autism, won a Bronze medal in bowling, scoring 415 points. Tita Carmel, Mike’s mother and a Board of Trustee at ASP, shared that being a part of this competition is enough for Mike. “For all of the challenges, training Mike encountered, he passed through he made it to the finish line,’ she said. Mike feels full of pride to win this battle with excitement. Aside from 2013 Games, Michael also represented the country in the Special Olympics World Summer Games held in Shanghai, China last October 2007 where he placed 4th in powerlifting and received commemorative medals too. Raymond Macasaet, a young man on the spectrum, won a Bronze Medal in the 200m Freestyle Swimming event. Raymond has also competed in Greece at the Special Olympics Summer Games in 2011, from where he took home silver and bronze medals for Freestyle Swimming. Raymond is a student of the Independent Living and Learning Center; and performed at the Angels Walk for Autism 2014 as part of the “ILLC Heartthrobs”. Mike and Raymond are only two of the many talented PWAs who have grown through the opportunities provided by Special Olympics. Connect with Special Olympics on Facebook to know more about their programs: https://www.facebook.com/pages/Special-Olympics-Philippines.